Neil Young's new album 'Hitchhiker' was released today is currently #7 #6 #5 on Amazon Top Sellers. 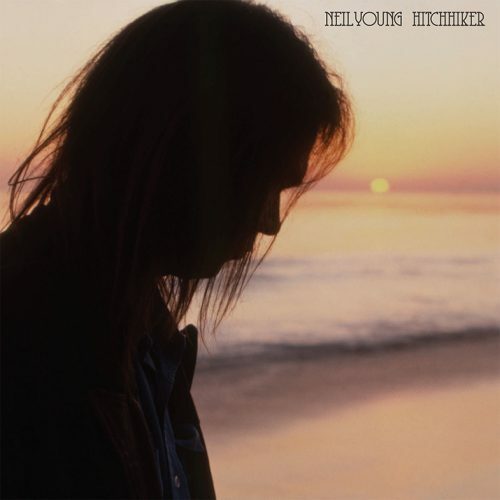 Hitchhiker marks a pivotal moment in Neil Young's ongoing series of archival releases: Instead of a live classic-songs set, this is a buried-treasure mother lode – 10 newly unearthed studio recordings, cut in one acoustic session, on August 11th, 1976. Young wasn't exactly swept up in the country's bicentennial spirit at the time; now grouped together rather than spread out over later records, the violence-drenched "Powderfinger," "Captain Kennedy" and "Pocahontas" feel like pointed rejoinders to the whitewashed history offered up during America's 200th birthday. He's in peak lonesome-guy mode on the never-released failed-relationship chronicle "Give Me Strength." Another previously unheard song, "Hawaii," is a spooky mysterious-stranger ballad. The take of the Nixon-sympathizing "Campaigner" here includes a newly relevant verse deleted from the version that appeared on Decade: "The speaker speaks, but the truth still leaks." The major find is the scruffy title song, an unblinking depiction of fame, "neon lights and the endless nights," paranoia and cocaine. Young eventually released it on 2010's Le Noise, bathed in electric guitar and with a verse about being thankful for his kids. There was no one to comfort him in '76: It's a journey through the past, but far darker. I listened to the whole thing last night and I was kinda underwhelmed by the whole thing. Don't get me wrong, these are great Neil songs, but some of these were the versions that were already released, and the alternate takes were nowhere near as good as the official versions, although "The Old Country Waltz" comes close. Not trying to be a downer here, cuz it is a pleasant listen, I guess. Visiting the past is fine, but I'd prefer Neil to stay focused on the present, especially in these increasingly crazy times that we live in. These are fun demos to listen to, but that's all they were. If Briggs and Neil felt differently, they would have put it out in 1977. Peace Trail shows me that Neil still has plenty to say in the here and now, so I hope that's where he keeps his head at. As we discussed previously, this contradicts the common version of the story in "Shakey" and elsewhere that the song was written on his 19th birthday in a hotel in Fort William while he was there with The Squires. And in "Shakey," discussing that period in Fort William in 1964, he says, "We were the new kids in town and we were pretty hot. Chick Roberts of the Cryin' Shames, he told me, 'That is one of the greatest songs I've ever heard.' That was just after I'd written 'Sugar Mountain.' "
Obviously to anyone with ears this is a wonderful release from Neil's golden era. The incredible subtlety of the vocal prashing, impassioned guitar playing, and lyrical performance make this possibly the Archives highlight so far. However, I do wonder about the claim this is a single session. There does seem to be some differences between the sonics and performances between songs. To my ears, Pocahontas- Captain Kennedy sounds different to the production values of Hawaii and Give Me Strength, which in turn sound slightly different to Campainger and Human Highway. And Old Country Waltz is different again. In the case they are different sessions I wonder why not just label it "Indigo Sessions" or such. We know Neil was up there a fair bit from '75 to '77 but I wonder how much other usable material there is. If he was there roughly 10-12 times a year, and this plus Will To Love is it, the maybe not very. So I'm Waging Heavy Peace on page 277 Neil mentions the Chick Roberts story in a paragraph about Toronto in 1965. Says he heard the song at a hootenanny. In this paragraph he's also describing the evolution of his folk style writing first writing The Ballad Of Peggy Grover, then Nowadays Clancy Can't Even Sing, and then Sugar Mountain. That's how I read it anyway. I think the Fort William story could be confused with the place where we first lost himself while playing, on Farmer John. Sugar Mountain in '65 where we first came into his own as a writer. I feel like the 1964 story started with John Einarson, would like to ask him. So now we have two versions of the Chick Roberts story, too, one in Fort William in 1964 and one in Toronto in 1965. If the latter is true, guess it all depends whether that hootenanny happened before or after Nov. 12. We know Neil led off with "Sugar Mountain" during his Elektra demo session, which the Archives book tentatively dates as Dec. 15, so that really solves nothing. And FWIW, Scott Young in "Neil and Me" repeats the 1964 Victoria Hotel version, tying it in with a letter Neil wrote him about being away from home on his birthday for the first time. As for other usable material from Indigo, from the Chrome Dreams boot we have the solo Hold Back the Tears and the Too Far Gone with Poncho on mandolin, which are both quite nice. Any of you well read folks see anything about Dean Stockwell in any of the books Neil wrote or in Shakey? I know a little It about Dean Stockwell's relationship with Neil? He's mentioned in all those books I think. Sorry for the multi-post Thrasher, meant not to do that. Very interesting that the '64 story is in Neil & Me too. That must be the first occurrence of that story. Though to further confuse the matter on The Canterbury House rap which takes place on November 9/10, 1968 he says that he wrote the song '5 years ago' which would place the song in November 1963! And this would be the earliest known reference to the writing of Sugar Mountain. Neil, people are opinionated for one reason: because they care. You have inspired many with your own talent and have always attracted intense people throughout your life. Sometimes these people do not get on well with each other, and there are fireworks. From David Briggs to your manager to the nutters who write reviews online (again: guilty, your honour). Often this has brought about some conflict, but always some very beneficial things, too. I love this record and hope there's more good stuff like it coming! And now it's number three on Amazon and the vinyl is number 9 so together they are probably #1!!! So cool! Richard: I think the sense of underwhelm you are feeling probably comes from the marketing of this release as an "unreleased album". It is unlikely this was ever strongly considered for release back in 1976, as powerful as it is to hear now in 2017. Some of the takes are more complete than others, but I think almost all succeed in capturing the pure essence of the songs (I think Powderfinger would benefit greatly from being given the Crazy Horse treatment and a key change). So yes, these are very raw versions, but I'm not sure "demos" is the right word (even if it is technically accurate). Only because that implies the songs were just ran through for recording purposes, rather than performed in earnest. I also wonder if there is some truth to Dom's suggestion that the tape might be a compilation of multiple nights? I'm not sure. Regardless, it doesn't matter: for me, this is a wonderful record, one that feels like it has always been there, with beautiful (and often precarious) versions of great songs that walk a tightrope to achieve magic. Give Me Strength and The Old Country Waltz in particular are really beautiful and very moving. Does anyone noticed it's special release series number FIVE! I really enjoyed listening to this over the weekend. Does anyone have a more recent acoustic version of Powderfinger? Maybe "acoustic café" or something? I just want to know if he plays the riff between the verses - I'm sure I've heard one where he does. I'm really happy this is out. I love the echo on the vocals - it sounds especially good on Pochahontas. @Babbo B and @syscrusher enjoying the research into Sugar Mountain! So Chick Roberts is my birth Dad, still alive at 86 years old, we just chatted after I found this msg board and he can confirm 100% he complimented Neil on Sugar Mountain in Toronto. Chick was the organizer of the Hootenanny's at the Riverboat. His band was the folk/jug band "The Dirty Shames" (not Cryin Shames), they were a popular band at the Riverboat and the Yorkville folk scene 1963-1966. Chick also played solo acoustic sets. Neil hung out socially at parties with the band and other musicians from the scene, and he used to thank Chick onstage when he played Sugar Mountain. Chicks memory is sharp and he's one of many Toronto consultants on that time period, Before The Gold Rush by Nicholas Jennings is a great book on the Yorkville scene(where Neil started out). Wow man that's really great that your Dad is still around with those old great stories to tell! I was just going back through all of this stuff, it would be great to have all of these stories pieced together into one, somewhere.